Before we get started: I would like to point out that although this product was given as part of a review campaign (and essentially this could be pegged as a sponsored post), I was not asked, nor was I under any obligation to write about it on my blog. I am thoroughly enjoying this shampoo, conditioner combo – I think my friends and family may too! 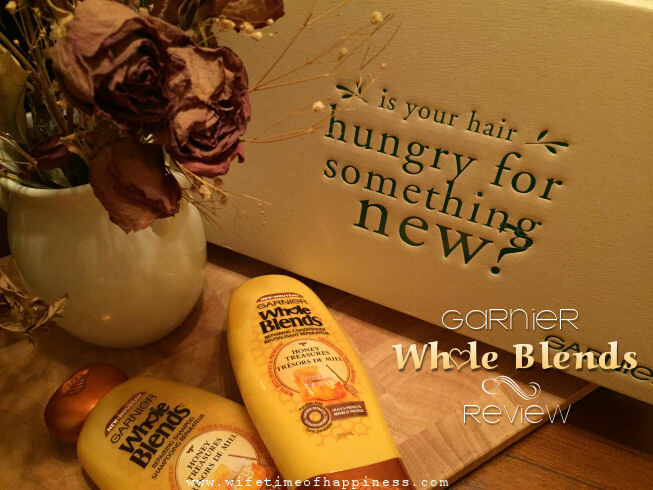 My review is for the Garnier Whole Blends Honey Treasure (Repairing). With a blend of Royal Jelly, Honey and Propolis, there is something beautiful about the texture of the Garnier Whole Blends. Although it is creamy, it does not leave the buildup of residue I have found many shampoos and conditioners to do. I was actually quite surprised in that aspect. I could literally feel the Honey Treasure Conditioner within the first wash. My hair was amazingly soft upon drying, making it very manageable to work with. I'm impressed, seriously! The Scent! Oh my. Whole Blends Body Wash..Make it happen. Or maybe it already has and I'm the last to know, as usual haha. There is so much freshness and cleanliness about this scent, lingering even hours after your wash. Personally I have used high end, to low end to everything in between – And although Garnier is more of an "affordable" brand, I would mark the Whole Blends line right up there with a higher quality product. I have no cons to report on for the Garnier Whole Blends Shampoo and Conditioner Duo, which is another reason I felt this post may be of importance! This is a Paraben Free Duo your hair is going to drink in and love! The Garnier Whole Blends line is available in many varieties – You are sure to find the perfect Shampoo/Conditioner best suited for your needs! Grab your free sample below, you won't be disappointed! Garnier is offering up samples – Click HERE to grab yours now, while supplies last! Thank you for stopping by, I hope to see you soon!